No baby can have to many bears. 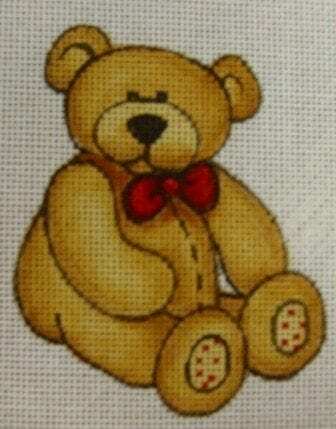 This cute little guy with his bright red bow can be stitched up very fast. Use some Christmas red Petite Very Velvet to give him a festive bow. Also if you use brown Very Velvet for his little chubby body he looks soft and cuddly. This canvas would be the perfect ornament for babies first Christmas. Canvas is 18 count and the design painting measures 3 x 4″.